ALBUQUERQUE, NEW MEXICO—Ok, I admit it: I’m a Mister Rogers junkie. I’ve been one for a long time; over 45 years of watching the man in the cardigan. Even for my recent birthday—49 years old, my daughter bought me a Mister Rogers saint candle. I lit it up with pride. And when PBS conducted a fundraiser using Mister Rogers as the lure, I bit. I’m now a proud owner of a Mister Rogers mug, bag, and DVD set. I told you, a junkie. Like most kids growing up in the early 1970’s, Mister Rogers was a daily presence in our lives: TV programs on PBS, books by Rogers, and the songs that got stuck in your head” “It’s a beautiful day in the neighborhood…Won’t you be my neighbor?” Mister Rogers was everywhere. I could give you a list of episodes I remember, but my favorite usually revolved around music, something that resonated in our family of musicians. But then something happened: my musical parents got a divorce. And in hindsight, I think Mister Rogers helped me through that difficult period in my life. In a way, Mister Rogers became a peaceful friend, someone that you could listen to and learn from. And as a Presbyterian minister, Rogers adages were spiritual sayings cloaked as affable advice (as we’ll see soon). As an adult, Mister Rogers helped a five-year-old cope with something the boy didn’t comprehend. As Rogers was everywhere in the late 60’s and early 70’s, so, too, he is today, fifteen years after his death. There’s the fabulous documentary, Won’t You Be My Neighbor, the forthcoming Hollywood movie starring Tom Hanks, and a couple of documentaries made by PBS, Mister Rogers & Me, and It’s You I Like. But don’t leave off the books; books were important to him. 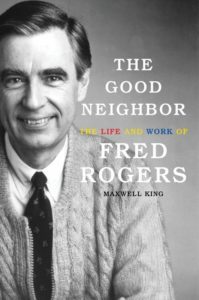 I recently read The Good Neighbor: The Life and Work of Fred Rogers by Maxwell King. It is marvelous, a full, but unfettered, account of Rogers life, ministry, and work. And then there’s Peaceful Neighbor by Michael Long. Long’s book explores the deeper sociological and theological implications of Fred Rogers life and worldview, which, as the subtitle states, helps you discover “The Countercultural Mister Rogers.” As one can ascertain from the title, Long’s book’s emphasis is on Rogers view of peace. The Simple Faith of Mister Rogers by Amy Hollingsworth explores the spiritual life of Fred Rogers, looking to people Rogers sought for solace and insight such as Henri Nouwen. Charles River edits a collection of essays celebrating the life and legacy of Fred Rogers. And these are just some of the books about Mister Rogers. If you were to get books by Fred Rogers (some posthumously), then the list grows by leaps and bounds. The question I pose in this short article is: why is Mister Rogers so appealing today, with a broad emphasis on his life and work? I think the answer to the question is complex, but with simple overtones. Esteem. Due to his strong Christian faith, he understood that each person is made in the image of God. 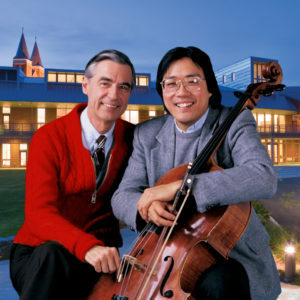 With this, Rogers promoted the adage,“You are special.” And though Mister Rogers wouldn’t deny people are scarred by sin (he was, afterall, Presbyterian), he chose to emphasize the uniqueness of the individual, a distinct group of people created in God’s likeness. Diversity. Mister Rogers understood that God was a creative Being. Meaning, the Lord created a diversity of plants, animals, and people; just look at the world and you will see. Mister Rogers celebrated this diversity by having a varied representation of people on his program: people of color, people with special needs, people of all stripes, styles, and nationalities. Creativity. If one thing rang true with Mister Rogers, the program celebrated creativity. From the “Make Believe” of puppets and trolleys, to guest musicians, artists, and actors, Mister Rogers Neighborhood was a place where creativity thrived. And when you add his classic compositions, tunes we still sing today, to the creative palate, Mister Rogers was a imaginative genius, promoting the arts to children like no other. Community. 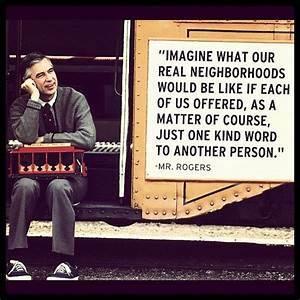 Mister Rogers also encouraged community. His Neighborhood—similar to the one he grew up in Pennsylvania, was a reminder that community counts. And unlike today, where many people don’t know their neighbors, in Mister Rogers Neighborhood you knew everyone, from the postman to the shoemaker, and everyone was welcome in his home. Education. Though not as explicit (meaning the kids didn’t sit at a desk), Mister Rogers promoted education and knowledge. We learned something by watching his program. On the various excursions he took to music stores, book stores, and various businesses, people got a sense of what makes the world tick and interesting. Working with various child development professionals, Mister Rogers Neighborhood was a school of the world. Care for Creation. Mister Rogers taught the importance for the care of all creation. From the fish he fed, the animals he highlighted on his broadcast, to the hug he got from Koko the gorilla (one of the moving scenes in the documentary, Won’t You Be My Neighbor), Mister Rogers demonstrated that all life matters. Fred said, “Anything is possible.” Jesus said, “With God all things are possible” (Matthew 19:26). Fred said, “Won’t you be my neighbor” and talked about responsibility. Jesus told a story about being a neighbor in the Prodigal Son (Luke 15), and the responsibility to other people. 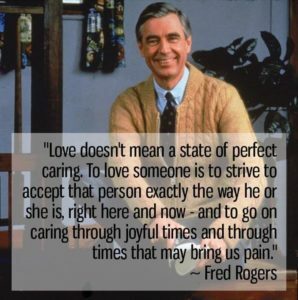 Fred said, “Love isn’t a state of perfect caring. It is an active noun like struggle. To love someone is to strive to accept that person exactly the way he or she is, right here and now.” Jesus, of course, exuded love in all He did and said, but also told us to “love God” and “your neighbor as yourself” (Luke 10:27). I think Fred’s saying are summarized by the Golden Rule taught by Jesus: “Therefore, all things whatsoever ye would that men should do to you, do ye even so to them” (Matthew 7:12). Life. 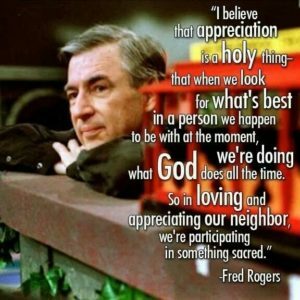 In short, Fred Rogers taught a whole generation about life, the mystery of living in the garden of God’s good creation. For Fred, life was a blessing. And what we do with the blessing counts. Rogers said, “The real issue in life is not how many blessings we have, but what we do with our blessings. Some people have many blessings and hoard them. 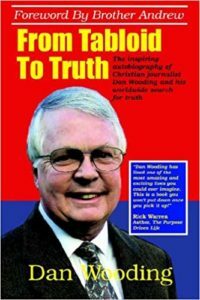 Some have few and give everything away.” And speaking of mystery, that’s how Rogers summarized our relationship with God. Rogers stated, “I believe that human beings are God’s vessels of mystery and beauty.” And that pretty much recaps what Mister Rogers taught about life: it is a gift from God, full of mystery and beauty, live it to its fullness with kindness, respect, and love. 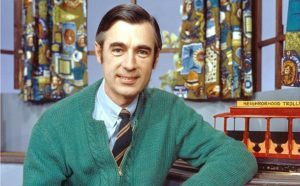 How we need more Mister Rogers in our world today!